Rediff.com » Sports » Will men's tennis see a flurry of women coaches? After Andy Murray broke down a gender barrier by hiring Amelie Mauresmo, 18-time Grand Slam singles champion Martina Navratilova says that men's tennis will see a flurry of women coaches. 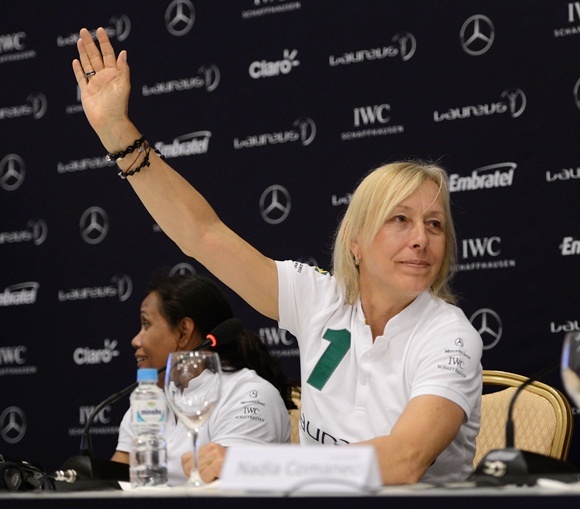 In fact Navratilova is also open to tutoring men. Briton Murray raised eyebrows with the appointment of former world number one Mauresmo in June but Czech-born American great Navratilova said gender should not be an issue when a player, male or female, selects a new trainer to work with. "When I looked for a coach gender never entered into it. I never thought I need a male coach or a female coach, it never occurred to me," the 57-year-old told a small group of reporters in Singapore on Friday. "In fact my first coach was a transgender, Renee Richards. It doesn't matter, the ball doesn't know if you are male or female, the strategy is the same. I know I could coach a man and I know there are plenty of women who could coach a man." The Mauresmo-Murray partnership is not the first of its kind with Billie Jean King previously tutoring American compatriot Tim Mayotte, while Marat Safin, Murray and Denis Istomin have all been coached by their mothers. But Murray, winner of the 2012 US Open and 2013 Wimbledon title, is certainly the most high profile male tennis player to opt for a woman coach. "If a guy like Murray doesn't care why should anybody else care? It widens the field and widens the possibilities," said Navratilova, the winner of 167 singles and 177 doubles titles on tour. "I'm sure for some guys it hadn't occurred to them to hire a women and its a case in all the sports. We don't questions men's coaches coaching women's teams but we question women coaching men's teams, why is that? "Certainly there are a number of women coaches that are capable and I think you will see that more. This is the future and it is happening now." Mauresmo's appointment by the Scot came after she helped compatriot Marion Bartoli make her grand slam breakthrough by winning Wimbledon in 2013 without dropping a set shortly after joining the Frenchwoman's team. Mauresmo, winner of the Australian Open and Wimbledon in 2006, has been praised for her early work by Murray, who has seen his ranking slump to world number nine after his struggles to regain his high standards following back surgery. Navratilova, who also won 41 grand slam doubles and mixed doubles titles, is not averse to following Mauresmo and coaching the men. "I need to be asked because I am not going to be asking for a job as I don't need it, but would I like to coach? Absolutely," she said. "I like passing on my knowledge and I feel I do that with my work on TV (as an analyst). Coaching one-on-one that's special. "So if that happens I would absolutely love to do that... I have always wanted to do it. But that situation hasn't cropped up yet. I would probably make more money coaching than I did playing tennis 20 years ago."